A wonderful new production of Ibsen’s A Doll’s House coincides with my watching Danish TV drama Borgen, providing a neat overview of gender politics over the last century. In the final, electrifying scene of Ibsen’s play A Doll’s House, Nora tells her devastated husband that he is a stranger to her and that she has to leave him and their children, because, as she says, “I cannot spend the night in a strange man’s room”. Torvald, panicked and desperate to stop her, asks Nora whether he could ever be more than a stranger to her. “The most wonderful thing of all would have to happen”, Nora replies. “Both you and I would have to be so changed that.. our life together would be a real wedlock.” Without waiting for a response, she bids him goodbye and leaves, closing the door of their marital home behind her – now one of the most famous stage directions in theatre history. Over 100 years after it was first performed, A Doll’s House has stood the test of time as an absorbing piece of theatre – its plot unfolds as deftly and mercilessly as a Hitchcock thriller – and a razor-sharp psychological portrait of a marriage. 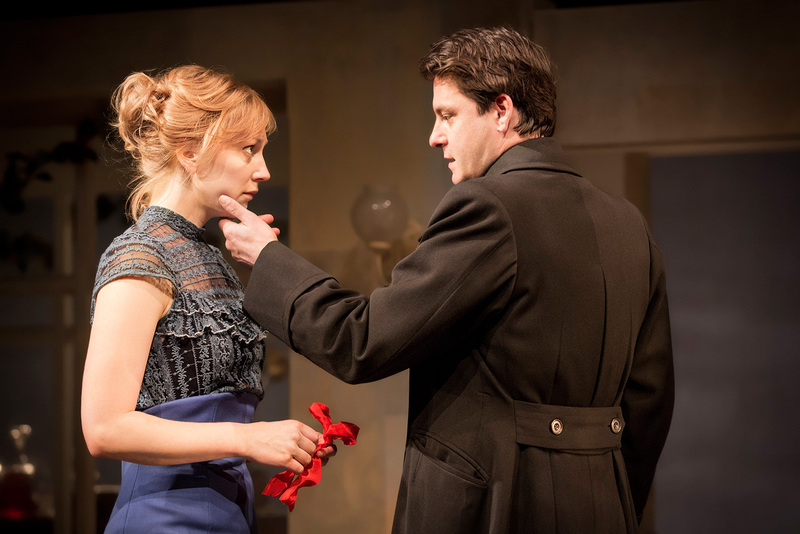 This weekend, I was lucky enough to catch the West End revival of the Young Vic’s 2012 revival of A Doll’s House, with a new adaptation by playwright Simon Stephens and a dazzling lead performance by 35 year-old London actress Hattie Morahan as Nora. In one of the lovelier coincidences of the year, my theatre date coincided with the end of a long week of watching Borgen, a Danish TV drama about a left-wing female Prime Minister running a centre-left coalition government. It was the perfect readymade “compare and contrast” exam question – to consider the legacy of A Doll’s House (written by a Norwegian but first performed in Copenhagen in 1879) with a pointedly feminist drama set in contemporary Denmark, over a century later. The most fascinating aspect of A Doll’s House, to me, anyway, is its ambiguity about the “heroism” of its heroine, especially in the dramatic final scene. The sight of a respectable middle-class woman leaving her husband was enough to create outrage when the play was first performed, and considered so shocking that Ibsen was later persuaded to write an alternative ending where Nora stays (though he subsequently disavowed the rewrite as a travesty of his original vision). “Why did she leave?”, audiences raged. To my mind, Ibsen answered that question with characteristic clarity and brilliance, though it’s been satisfying to see in recent years a rethink of Nora’s leaving speech and what the play has to say about women’s rights. Generations of Ibsen’s admirers, from George Bernard Shaw through to 70s feminists like Elaine Showalter, have hailed Nora as a proto-feminist icon, and hung on her parting words as a battle cry for female emancipation. Rather bizarrely, Unesco’s Memory of the World Register calls Nora “a symbol throughout the world, for women fighting for liberation and equality”. Ibsen was, by all accounts, quite cross with this interpretation, even when offered kindly by Shaw as a compliment, and argued that the play was less about a woman freeing herself from a marriage than it was an individual’s search for their own identity. It’s perhaps a sign of our growing comfort with women’s equality that we’re able to let go of A Doll’s House a bit and consider a darker and less celebratory interpretation. The Young Vic’s production, my fourth time seeing the play on stage, felt satisfying to me in a way I haven’t experienced before, largely because of the sense of panic and uncertainty that Morahan brings to Nora’s final-act epiphany. In most other versions I’ve seen, including a stately if somewhat bloodless version at the Donmar a few years ago starring Gillian Anderson, Nora blooms into consciousness like a hothouse rose, stakes her claim to her own identity and strides out of the house resolutely like Joan of Arc heading into battle. Not so with Morahan, who nearly disintegrates under the pressure of hiding her secrets and whose departure is a rushed, panicked, near hysterical affair. It’s to Morahan’s great credit as an actress that she lays bare all her character’s hair-trigger impulses, sometimes several in the space of a few seconds, while never settling complacently into a single emotional groove. Her Nora is confused, panicked, terrified, grief-stricken at the impending thought of leaving her children and simmering with rage – in other words, like most ordinary human beings in a middle of a life-changing crisis. As the front door slammed and the curtain fell, I felt worried for Nora in a way I haven’t before. As Ibsen himself pointed out, the challenges Nora would face trying to find herself in a male-dominated world would be immense, particularly for a woman with no way of supporting herself, and might engulf her completely (as they do for Nora’s evil twin Hedda Gabler, another of Ibsen’s married women in crisis). Morahan and her director Carrie Cracknell went bravely, and I think appropriately down this line, finding great beauty and poignancy in Nora’s decision to leave, while delicately suggesting that the outcome will be damaging for everyone concerned – Nora, Torvald, and especially their children. This reading makes A Doll’s House less conventionally heroic but somehow more powerful in the process. Modern-day audiences, at least here in the wealthy West, have the benefit of over a century of “progress” with which to reconsider and re-evaluate Nora’s position. Unlike Nora, or Ibsen himself, we’ve been through the looking-glass of first-, second- and third-wave feminism and through to the other side. While we can affirm that Nora and many women like her absolutely had to leave their marriages, we can also acknowledge that it aint easy for anyone involved, even nowadays where women can earn their own living and don’t need a husband to maintain their social respectability. What’s equally as fascinating about A Doll’s House is that even while most productions, like the Young Vic’s, feel obliged to stage the play in a 19th century setting, the play itself is too elusive and expansive to stay quietly as an antiquated period piece. There’s something about the boldness and vitality of Ibsen’s writing, the confrontational directness of the plot and dialogue, and the messy lack of resolution in the finale that makes the play feel relevant and somehow modern. Part of this is down to Ibsen’s perceptive and sympathetic brand of liberal humanism. Nora, like Hamlet and all the other great literary characters, is a complex, contradictory creation, heroic and flawed in turns, and flickering between self-awareness and conveniently self-serving deception. While much of Nora’s dilemma is specific to women of her time, Ibsen locates many of her problems as universal to most human nature(s). In the story of one woman in a marriage, he manages to transverse the struggle to find one’s true self within family convention; the impulse to hide parts of the self from others to maintain their approval; the compulsion to keep up social appearances; the shaming secrecy caused by being in debt; and the illusory appeal of magical thinking in which, as Nora hopes, a “miracle” might happen to transform a difficult situation. I squirmed uncomfortably through the scenes where Nora trembles with panic as Krogstad threatens to reveal her dirty little secrets to the world, and she imagines herself unloveable or unable even to exist unless she continues to play her assigned role. (Nora’s sense of claustrophobia is wonderfully underscored in the Young Vic production by Ian MacNeil’s set, a window-filled doll’s house, in which everything can be seen and there is literally no space to escape to.) The scenario may be antiquated in modern terms, but the psychological acuity of Nora’s position still feels intensely and troublingly familiar to many of us, whether male, female, partnered or single. Nora learns, at great personal cost, that miracles don’t happen, and that her personal salvation can only be found by her, alone. Whether or not she finds it after the play’s end is unknown, and depends, I think, on whether you’re an optimist or a pessimist. One of the enduring strengths of A Doll’s House is that it can support a range of readings, and still pack an emotional punch. In fine productions like the Young Vic’s, we see that that the legacy of A Doll’s House is a difficult and unresolved one. While women may have won the right to leave their husbands, earn and keep their own money and leave independently of men, the “problem” of male-female relationships and the search for personal identity are still with us. It was with some relief that I left Nora and her uncertain future behind at the theatre, and headed home to the expansiveness and optimism of 21st century post-feminist Denmark, as represented in the marvellous Borgen. 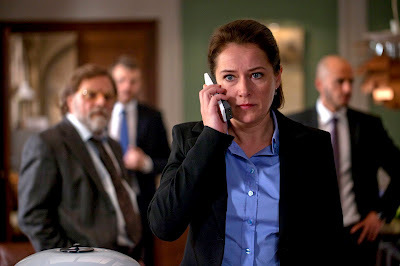 Centre-left party leader Birgitte Nyborg (played by the marvellous Sidse Babett Knudsen) dazzles the electorate in a live TV debate and unexpectedly gains the majority in a general election, forms a coalition government and becomes Denmark’s first female prime minister. (In a cute art-meets-life moment, the Danes gained their first female PM for real after Season 1 of Borgen screened). With an economy and clarity that’s reminiscent of Ibsen, Borgen fuses a complex, perceptive take on contemporary politics with the domestic melodrama of family life. As Birgitte attempts to juggle running the country with her marriage and children, the series asks the great question that’s flummoxed feminists since they first stepped out of the kitchen: can women have it all? Characters like Nora could only dream of the kind of independence that Birgitte enjoys: education, the vote, a political career, a supportive stay-at-home husband, a wardrobe of smartly cut business suits and endlessly photogenic hair. Like The West Wing before it, Borgen shares a deep interest in and love of political process, but with a sturdy Nordic clear-sightedness and efficiency replacing The West Wing‘s hyperactive dialogue and self-congratulatory flag-waving. Thanks to some excellent screenwriting, politics is revealed not just as a Machievellian power struggle, but as a series of moral decisions made by intelligent and principled people who are considering more than their own self-interest and who might just be able to make the world a better place. Unsurprisingly, Borgen became a favourite of middle-class Guardian-reading liberal types like me, who revelled in its almost idealistic portrayal of a female PM. Here in Britain, Borgen seemed to be both fantasy and palliative to a disillusioned political scene. Britain’s only example of a female PM to date is the authoritarian, ultra-conservative and highly divisive Margaret Thatcher, and Britain’s left-leaning parties still haven’t managed to purge themselves of the taint of the Tony Blair years, now popularly characterised by deceptive spin doctoring, reckless financial deregulation, pandering to private enterprise and participation in a useless and morally comprising foreign war. By contrast, Birgitte and her coalition government govern with the benevolence and sensitivity that left-wing liberals always imagine that their leaders will bring to the top job: rejuvenating the social welfare system, promoting green energy initiatives, introducing gender equity quotas in boardrooms and successfully intervening to prevent war in an African nation. Birgitte represents not just a first in the history books, but the fulfilment of that old Women’s Studies chesnut about a return to matriarchal leadership as the key to saving the world. But as Borgen digs in, it’s evident that Denmark’s famed egalitarianism is only skin-deep , and that Birgitte’s struggles aren’t so completely removed from her predecessors. As the narrative progresses, it’s clear that Birgitte’s sucess in the political arena has a devastating effect on her family life: her husband becomes progressively less enchanted with her long absences and leaves the marriage, and her children develop anxiety disorders (bedwetting, panic attacks) in response to their perceived abandonment. “We can’t have it all,” Birgitte concludes grimly, referring both to the limitations of public policy and her troubled home life. Again and again, I pondered whether Birgitte’s problems would be quite as devastating if she were a man, and concluded, depressingly, probably not. Early on in the series, a male politician experiences problems when his mentally ill wife feels neglected, but his career survives; by comparison, Birgitte’s family life and career comes close to imploding when she comes under similar pressure. Women, it seems, are still wives and mothers first – unless they choose not to have children. The choices afforded to modern women, unimaginable to women of Nora’s generation, are showcased clearly in the series – one character chooses to have an abortion rather than derail her life and career with an unwanted pregnancy. But what’s striking in Borgen is the realisation that women must choose between family and career whereas men continue to have and enjoy both, largely unchallenged. Drama wouldn’t be drama without the drama, of course, and part of the fun of Borgen is watching Birgitte find her way through largely unchartered waters, juggle being PM as well as a wife and mother, and fend off the not-so-quietly entrenched sexism that exists in the media and political spheres she operates in. In a particularly revealing and witty storyline, Birgitte’s government rolls out a national gender equity quota, prompting a furious backlash from corporate moguls. In parallel, we see how the ambitious young female politician promoting the bill gets judged on the basis of her looks, but also that she lied about her past to shatter the glass ceiling and get ahead. It’s a nice recognition of the complexities of modern feminism, and the realities of male-female gender relations that can’t be legislated away overnight. If Borgen is anything to go by, Ibsen and Nora can sleep in their graves contentedly, knowing that the torch has been passed successfully to subsequent generations, that life is considerably better for (some) women, and that (some) men are sympathetic to gender equality. We’ve come a long way since Nora first headed out the door, though, as Birgitte represents, we’ve not yet found the right balance for women who want to go out the door to work every day and come back again. We’ll get there one day, hopefully, and until then I’m grateful for writers like Ibsen and the creators of Borgen to track our lives and times so eloquently. Ian MacNeil’s fantastic set was so attention grabbing that it took on a life of its own. The revolving rooms not only brought the ‘doll’s house’ to life, but also added a filmic quality to the play, its tracking-shot style keeping the momentum going and in turn keeping Nora ‘trapped’ inside the house and the story.